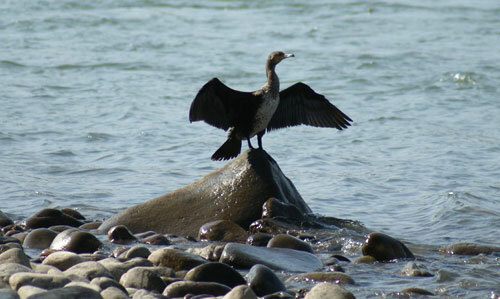 Beneath the azure sky and across the foothills of the Kingdom of Bhutan, flows the Manas river. Originating in the mountainous region of the kingdom, Manas meanders into the Barpeta district of lower Assam, where it goes by the name of “Beki”. Beki is a river of sorrow; flooding and eroding large portions of cultivable land, every year during summer. Manas, on the other hand, is less destructive. The river is always in the bucket list of tourists and on their trails during winters. Its pristine aquamarine water gently flows through a wide expanse of stones and pebbles, over looking a host of “Kohuan” flowers to the northern flank of the river. 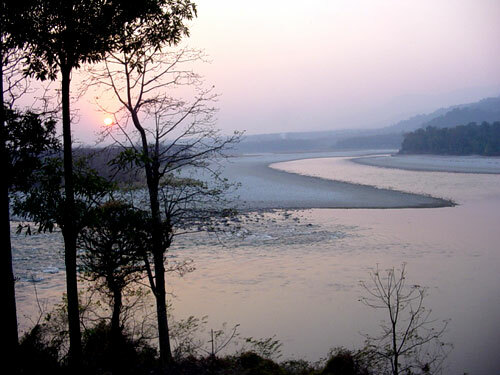 The river cascades through the Manas National Park and Tiger Reserve Project in the BTC (Bodoland Territorial Council) area of Assam. The national park is a World UNESCO heritage site, spread across 950 km. Lured by the charm of the river and the park, I (along with my son—an avid nature lover—and my close friend and his wife) packed my luggage on a December morning. With prior arrangements at a make-shift lodge set up by some rebel turned self-employed local guys, we decided to go on a night Jeep-Safari after a scrumptious dinner. We mostly encountered large-horned Sambar deer whose eyes sparkled in the heart of darkness. It was rather calming to watch them roam carefree at night. At a particular spot, we even saw a tiger’ silhouette. With burning eyes, it was waiting for the right moment to pounce on its prey. We stayed there for a while, with a hope to catch a glimpse of it going in for the kill, but in vain. It retreated after sensing our presence. Upon returning to the lodge, we were greeted by a bright and warm bonfire. We sat around the fire, gulping copious amounts of a famous Australian Yarra Valley red wine and regaling each other with stories of the wild and recounting experiences. It was well past midnight by the time we retired to our cottages. In the middle of the night I woke up to a foul smell. Peeping through the window, through dense fog, I could see the silhouette of another full-grown tiger, sitting and warming itself near the leftover fire. I woke up my companions immediately, and together we witnessed this rare scenario. It almost felt as if the tiger (possibly a Royal Bengal breed) had come to greet us saying “Hello guys! Welcome to Manas!” It soon disappeared and mingled in darkness. 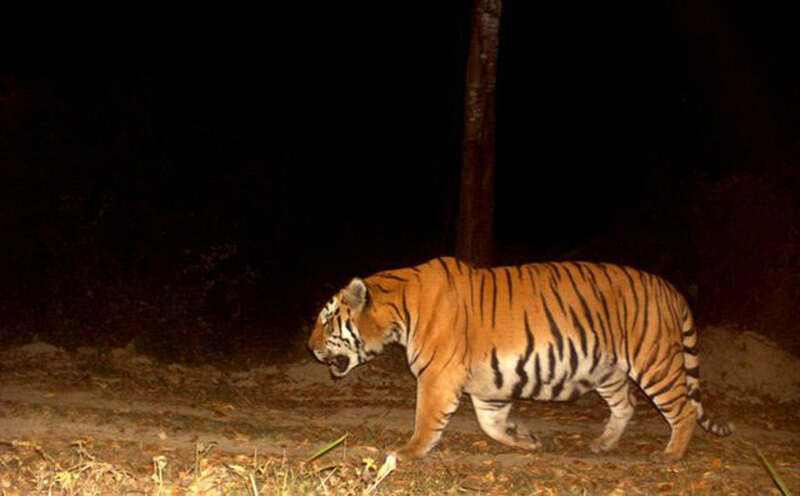 It is believed that tigers don’t stay at a particular spot for long. 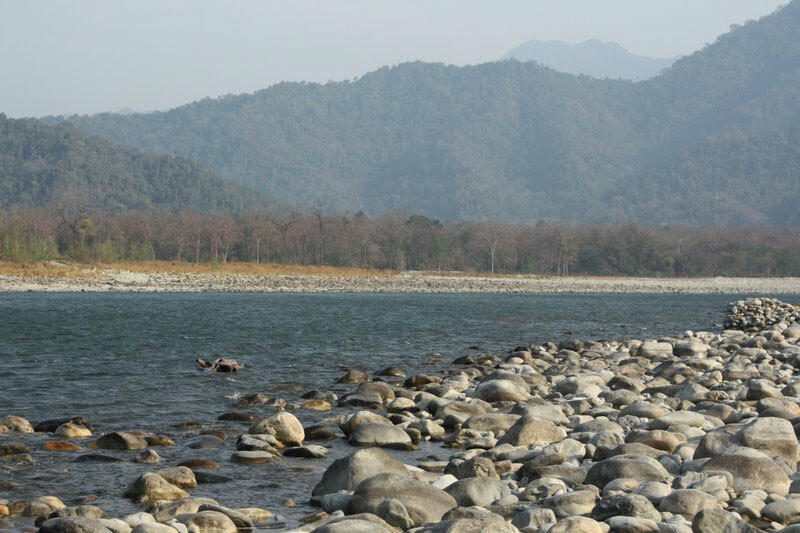 The youthful Manas river was beckoning us ever since we landed at the National Park; so we decided to take the river route on our return journey the next day, up to the park’s entrance. Seven of us, including two boatmen and a rifle-holding forest guard, boarded the properly inflated rubber boat for the downward journey, cruising gently and viewing the breath-taking scenes all around. Although we experienced some mild turbulences, we were soon greeted by flying ducks and deer peeping at us occasionally from the jungle. 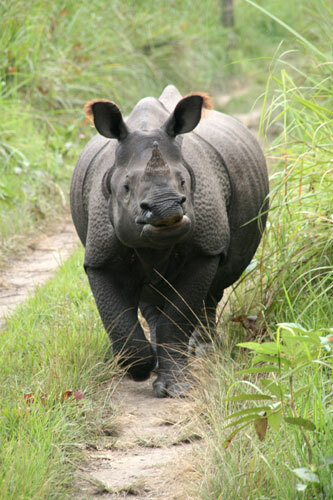 If you get a chance of visiting the Manas National Park, do not forget to visit the nearby Panbang modern village in Bhutan and the Royal Private Lodge to the northern flank of the river to meet our cousin “Golden Longur”. Toseswar Saikia is a retired executive of Indian Oil Corporation Limited ( Assam Oil Division), Digboi and an Alumni of Tata Institute of Social Sciences, Mumbai. 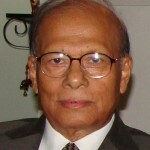 Ever since his retirement from service he has been living in Guwahati and devoted as a free lance writer of both Assamese and English language and a travel enthusiast. He also likes to play Golf in his spare time. He can be contacted at toseswarsaikia2014@gmail.com or mobile number 98640 90732.